As a sensate infrastructure, the body conveys information to and from the brain to complete a perceptual concordance with consciousness. This system of reciprocal communication both positions consciousness in spacetime, and allows that consciousness is dependent upon the body to roam. Through movement we comprehend. The corporeal occupation of spacetime permits human consciousness access to the phenomena of its physical environment, whereby it uses language (utterance) to both construct and describe this existence. This mediated transmission evolved into story and narrative in an attempt to apprehend, control and more importantly convey what is perceived. It is precisely the components of space and time, critical elements to our own existence that play such a paramount role in our ability to generate meaning and narrative comprehension. As our dimensional understanding has evolved and extended, so too has our understanding that space and time are crucial components of narrative. With the emergence of auxiliary narrative spaces, this movement of consciousness affords opportunities to create new narrative imperatives. In the theoretical realm of physics, the tesseract makes it possible to overcome the restraints of time. The tesseract is a gravitational wormhole that represents the physical compression of space that circumvents time in order to move from one location in spacetime to another. The index, as part of the body, but also the mechanism for applying a collapsed signification, requires both utterance (mediation) and event (temporal-frame) in order to create cognitive meaning. 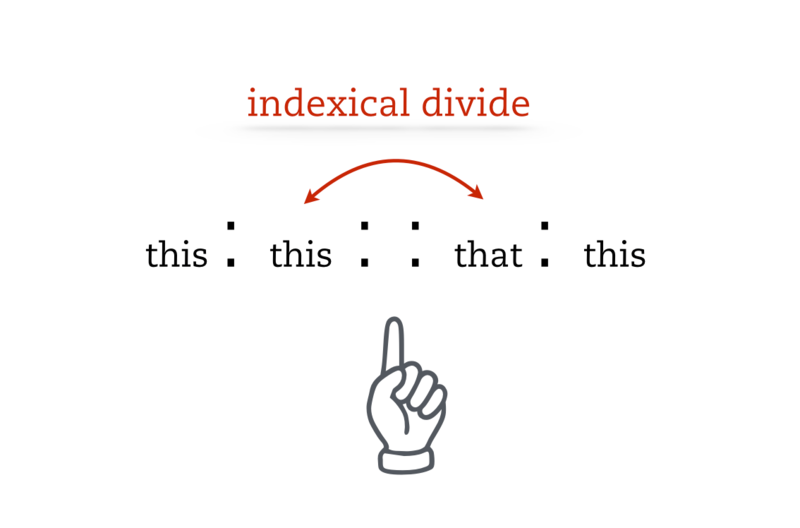 The indexical functions as a linguistic tesseract that collapses language creating a bridge over the semantic divide between utterance and meaning. This paper places the function and potential of the tesseract within the paradigm of cognitive narratology through the argument that compression is the mechanism for narrative construction of story, autopoiesis, and the locality of self. My grandmother owned an antique clock that kept imperfect time. It sat on the mantle of the family sideboard and whittled the hours away, chiming randomly, at odds with the intervals of the world. Its tinny peals called attention to an alternate time creating moments of estrangement, and conflicted with the fluid time in which we felt submerged, the time measured by more precise instruments like my father’s Timex® watch. The alternate time my grandmother’s clock intoned speaks to the flawed movement of its mechanical clockwork center. Time, however, is inherent to movement. Indeed, it was Newton who instituted the clockwork model of time until Einstein taught us of its relativity. In the time it has taken you to read this, time has drifted from the present moment into the past on its steady way into the future. There is no stillness in this because as you sit in your chair, you are moving at 1000kph relative to the Earth, which is itself moving at 70,000kph, tethered to the Sun as part of the Solar System that makes its way around the rim of our Milky Way. Consequently, our solar notion of time can be supplanted with the helical, in that like a great cosmic chronometer, time is still confined by movement within the vast mechanism that is the Universe. Time requires movement for us to comprehend it; space is its necessary complement. 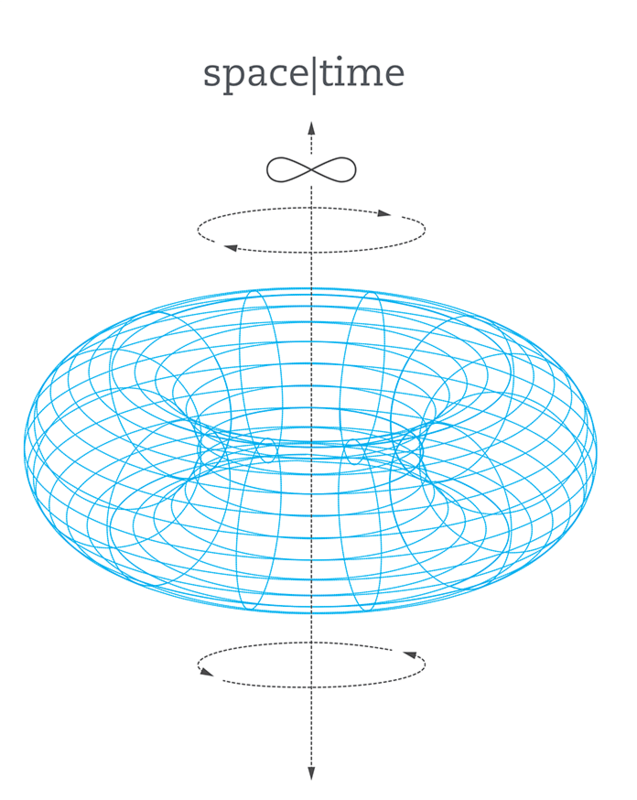 Time and space are along one and the same continuum: spacetime. 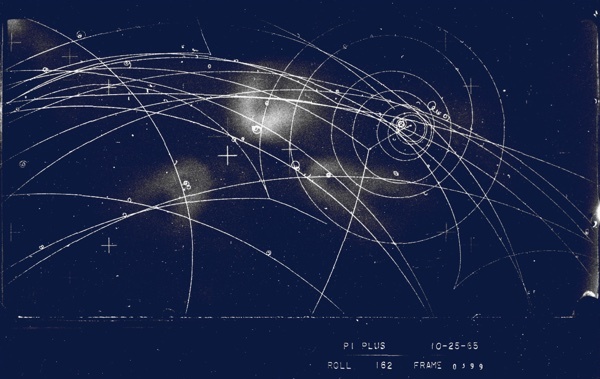 The notion of space, and its connection to time, are crucial components of narrative. It is precisely the components of space and time, as critical elements in our own existence, that play such a paramount role in our ability to generate narrative meaning and comprehension. Narrative is the imperfect clockwork mechanism that allows us to slice time into divisible units for study, examination and comprehension. Narrative allows us to locate ourselves in time, but also to unfasten our existence from the arrow of time in order to gain access to a space of comprehension. “Narrative is always strategic, for both teller and listener, in ways that can range from the callously selfish to the generously prosocial. Because natural selection occurs at multiple levels, it can assist individuals or groups at different levels in their competition with other individuals or groups. 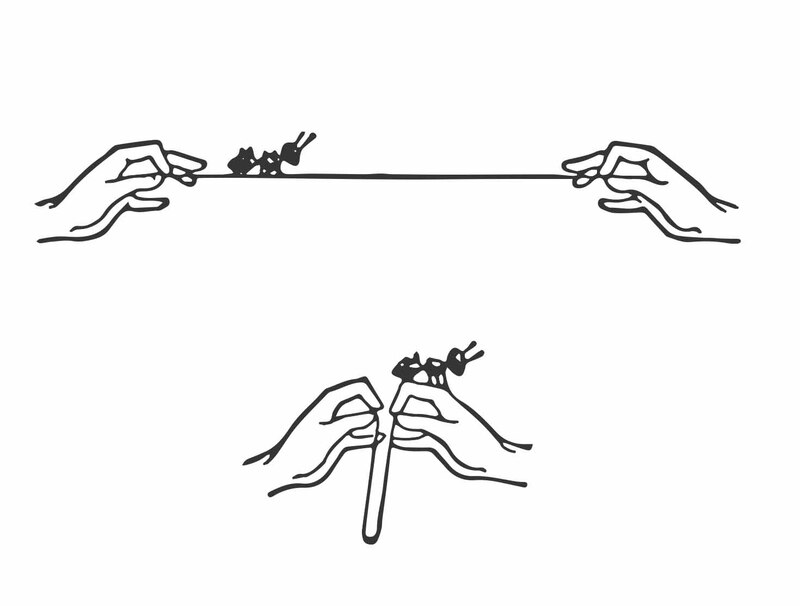 But narrative especially helps coordinate groups, by informing their members of one another’s actions. It spreads prosocial values, the likeliest to appeal to both tellers and listeners. It develops our capacity to see from different perspectives, and this capacity in turn both arises from and aids the evolution of cooperation and the growth of human mental flexibility.” (Boyd 2009, Kindle locations 2010-2013). Boyd contends that through the stories we shared, we co-opted our evolutionary imperative and took command of our own development. In essence, narrative enabled humans to evolve from the forests and veldts of pre-history into urban areas of post-modernism. While Dawkins, and Blackmore identified crucial and critical elements of memes, a further examination of how memes are transferred is needed. For memes to function, some mechanism for their transference and/or imitation, present in memes themselves, needs to exist. If it is through our stories as narrative acts that we come to be who we are, it can be argued that memes exist because we do. Memes are stories, and like all narrative they rely on utterance to replicate. As an element of speech communication, an utterance, for Bakhtin, is a grammatical unit, in the form of a sentence, found in the speech act or any text. He suggests that appropriate spheres of communication exist within which such utterances take place, and through that placing they make sense. Utterance encapsulates experience; however, Bakhtin contends that utterances reach relative stability within spheres of speech communication when recognized as genre. (Bakhtin 1986, 60–63) Bakhtin’s definition of utterance is limited to the confines of speech and textual analysis. For him, an utterance is concrete because it is a discernable unit—a sentence—however, when one moves beyond a structuralist approach it can be argued that an utterance is any concrete communicative act that requires a mediated format for conveyance, be it gesture, sound, image, text, digitization, etc. in order to transfer information from one conscious entity to another. This expanded definition allows for the exploration of utterance as a carrier agent for the memetic transfer that is crucial to communication, survival, learning, and so on. The explication of memes as transferring agents of information via narrative formatting—the mediation of utterance—is compelling because when memes and utterance are considered in conjunction, as message and message carrier, the mechanisms of narrative communication become more discernible. 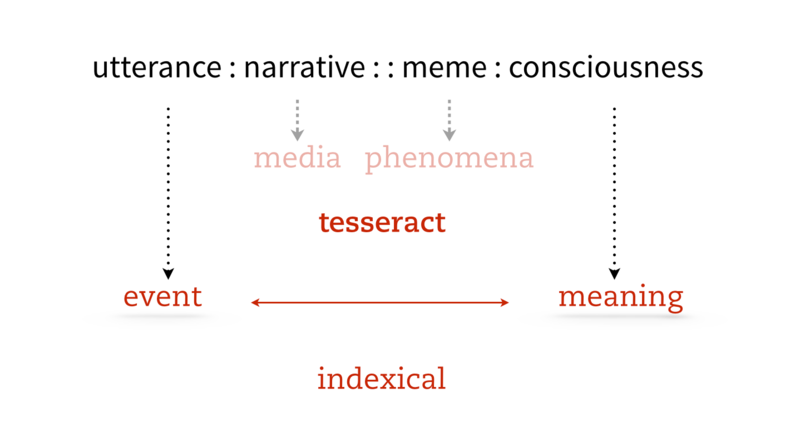 These constituent elements combine to produce narrative acts that both influence and impact consciousness (via memesis) by way of mediated experience. Meme and utterance are the apparatus for how we apprehend and express our existence within the realm of perceptual consciousness, but also between ourselves as members of groups. This expansion of utterance allows, too, for an investigation into realms of mediation that are currently coming into existence—those perceptual experiences offered in augmented and/or virtual spaces. Narrative is transforming. Technology is rapidly creating new mediating paradigms and narrative spaces, and our adaptation must advance as we enter these spaces. The proliferation of media creates a necessity for a media conscious narratology that can also consider the implications of space, time, consciousness and the body. This quote from 1967 was prescient then, and remains relevant today, fifty years later. McLuhan recognizes the comprehensive and pervasive impact media have on us. His emphasis on the psychic and physical impact of media is important and germane to this discussion because emerging media have a profound affect upon the body and brain. Because utterance can be considered as any mediated messaging format, it will entail some form of cognitive conception to effectuate the communicative act. An enlarged definition, one that considers internal and external utterance, in conjunction with cognitive narratology, will allow for an examination of the processes by which interpreters, or audience, make sense of mediated representations of their artifacts (that is, the making of meaning and communication). The body conveys information to the brain, where it is reasoned and comprehended, and in turn, the brain uses the body to explore its environment. Internal utterance, the intermediary aspect of this process, navigates and negotiates between the brain and body. This transaction emerges as consciousness. External utterance functions as the agent of mediation that allows the interplay between brain and body to be expressed. Thus, cognitive narratology when allied with expanded utterance and narrative acts enables one to explore how utterance functions as both a target of, and for, interpretation; and how utterance facilitates sense making—in other words, how it enables us to structure and comprehend the world. In other words, embodiment plays a substantial role in the production of communicated meaning because the brain instigates where and what the body has experienced in its environment. Not only does this reciprocating action help define the self, this collection of narratives acts, over time, produces our shared heritage and helps establish our various cultures and their attendant constructs (foods, architecture, dress, language, etc.). It can be argued that these aspects of culture are equally influenced by, and dependent upon, their surroundings for their existence. This then begs the question: what happens when our narrative spaces evolve and are drastically altered such as they are presently with the advent of auxiliary realities? Our immersion in such alternate realities, and the ways they might occupy space and time, will require us to question the role of the body, the brain, mediation and consciousness relative to these new narrative dimensions. Upon entering this new realm what becomes of consciousness and the narration of our events? 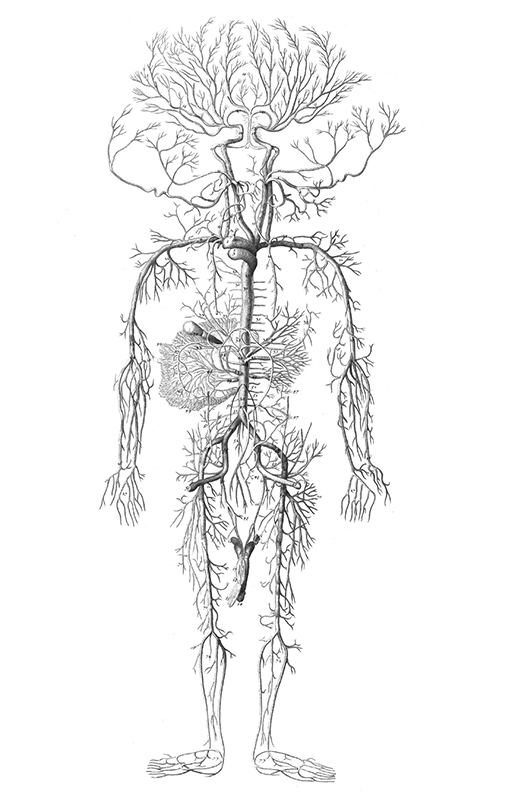 Damasio argues we should no longer look upon the mind and body as disconnected, individual entities, but rather we consider their interrelationship as complementary aspects of our own existence. The body is incapable of survival without the brain, but so too the brain requires the body as a sensate apparatus in order to explore the world. They exist in a symbiosis that has cast them as both vehicle and chauffeur in their in esse. While the discord produced by mind/body separation, and its implication on Western thought, has provided ample fodder for psychology, philosophy and other humanist contemplation, it falls outside the scope of this inquiry. However, the apparatus of consciousness, and the role of the body, as explored in the field of embodied cognition does intersect with this consideration of narrative. Embodied cognition, however, concerns itself not just with the brain, but also with the body, and their mutual relationship with the environment. 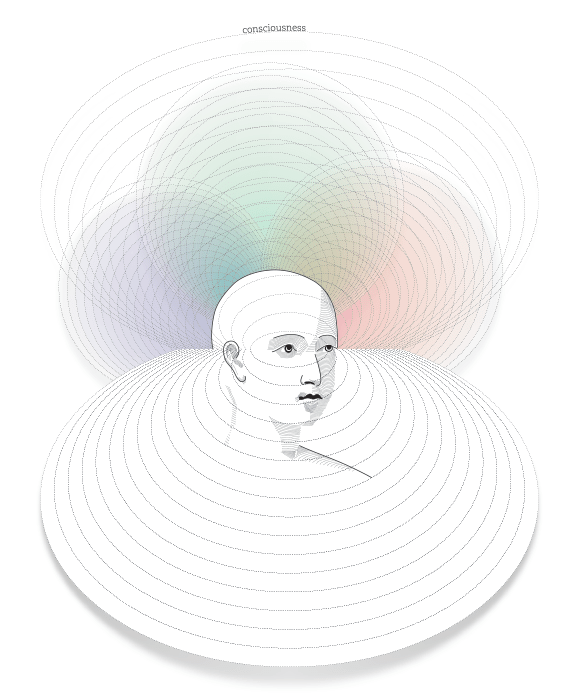 Embodied cognitivists view the body as an incumbent feature of the cognitive process—it is the interplay between the brain, the body and the environment that is important. As Shapiro notes, embodied cognition “resists the idea that cognition is solipsistic, and so rejects the idea that subjects are passive receivers of stimulation.” (Shapiro 2011, 26–27) Rejecting the notion that the brain is a neutral recipient is pertinent to this investigation because the interplay of mind, body and space plays a paramount role in the construction of consciousness. It is the interdependence of mind and body that creates consciousness which in turn is the recipient of narrative information, as well as the actuator of narrative acts. Linguistic determinism aside, his contention that meaning is a physical and mental process is consonant with the assertion here that the body is that portion of consciousness that is attendant to and present in space. Meanwhile, the brain, housed within the body, processes the information sent to it by the body, yet it also instantiates, apprehends and appraises the information it receives over and through time. Consciousness, as an evolving and emergent agent within this process, can be thought of as an intermediary component of this relationship between mind and body. Taken together this is the entity that is present to the phenomenon of spacetime. The index, as part of the body, but also the mechanism for applying a collapsed signification, requires both utterance (mediation) and event (temporal-frame) in order to create cognitive meaning. The semiotic indexical functions as a linguistic tesseract that collapses language, creating a bridge over the semantic divide between utterance and meme to arrive at narrative meaning and comprehension. The following syllogism is offered as a aid in describing how this relation functions. This equation demonstrates that utterance’s relationship to narrative is similar to how memes impact consciousness. This syllogism also reveals the mechanism by which the transference of meaning takes place. As indicated above, narrative can be conceived of as the act of mediating utterance, in order that it may be delivered (as a meme, but also understood as any form of communication ) to another conscious entity that understands the code in which the message has been composed. This encoding takes place by way of short-circuiting, through compression—a tesseracting of language/concept—by allowing us to regard, as well as convey, various certain aspects of perceptual qualia from one concept into and on the qualia of another. Qualia is defined here as those phenomena that account for sensations, impressions, emotions and perceptions, as introduced by Peirce, (as quale), (Peirce 1866) and later refined by C. I. Lewis. (Lewis, 1929) In effect, the indexical tesseract places one variable, and the system it is embedded within, in close alignment with a another. This isolation magnifies certain characteristics of a qualia, while at the same time makes comparative possibilities available, that in turn, closes the semantic gap between these systems. Again, though this is similar to mechanisms present in the indexical hypothesis, the attention here is on the event and the mediated utterance. Given its roots in phenomenology, its use within probability theory, particle physics, theories of relativity and embodied cognition, event, in the context of narratology can be seen as segments of spacetime that allow for narrative acts of mediation to exist. Fundamentally, an event demarcates the time-frame of a narrative utterance. The event, as described above, is an encryption of qualia that exist in one portion of space, sent and decrypted in an alternate portion of space, in effect, circumventing time and allowing for a linguistic collapse that supplies meaning. Events delimit the time it takes for a consciously mediated utterance to cross space and be consciously received by another. Additionally, utterances and their events can also be seen as qualifying units of time that allow for the creation of self through the act of autopoiesis, those mechanisms that create and maintain the self, (memory, reflection, recursion, etc.). More broadly, collected events as meditated artifacts allow for an examination of consciousness, as well as, appraisals of cultural signification. This collapse—or tesseract—has compelling implications when examined within the framework of embodied cognition and its attendant role in consciousness. What is perhaps more exciting, however, is the application of this idea in examining emergent forms of narrative, particularly those offered within auxiliary realities, and the impact this will have on perceptual consciousness. Augmented reality and virtual reality have long been standard fare in speculative and science fiction writing. L. Frank Baum, in The Master Key, was the first to make mention of a device (a pair of spectacles) that would enable its user to see beyond terrestrial limits. A little less than one hundred years later, the space drama Star Trek made much use of its holodeck as a narrative device. This narrative event, while predating actual reality, legitimized the appreciation for auxiliary spaces to such an extent that audiences rarely questioned the existence of such volumetric confines. While fiction can and does continually play with our perceptions of the possible, narrative made the acceptance of such alternate spaces probable. Because they have been confined to a flat paradigm—that of the page or the screen—general audiences have yet to fully experience these ancillary dimensional spaces for themselves. As we continue to investigate the space of our own locality, our modeling capabilities greatly benefit from the narrative shifts offered within these simulated spaces because conceptual dimensions, like hyperspace, become exceedingly more ‘graspable’ using these technologies. These simulacra offered by alternate realities bestow us the capability to explore and apprehend environments beyond the capacity we were afforded as residents of this planet. Cyberspace truly becomes a dimensional extension of our mediated understanding that is above and beyond the realm of our bodily senses and conscious awareness. Studies have demonstrated that these supra-real experiences are verifiable. Their understanding and apprehension was mitigated to such a degree by the virtual reality they were presented that it became their world. The environment they inhabited contained dimensional space they could occupy and move within. This is a profound demonstration of how media is working us over. Our bodies and the brains they ferry evolved for the spacetime we inhabit. As we create alternate realms that are both mind-enabling and mind-extending, narrative, a fundamental component in our evolution, will still be present to the exchange that happens between the environment, the body and the mind. However, alternate spacetimes will test the nature and capacity of narrative because the gap will be mediated so much faster and in ways unforeseen. We have relied on the mediation of utterance to inform our communication for most of our existence. Our cultural inheritance as well as the way we create ourselves has depended upon how well we mediate our needs, desires, etc., but what happens when the entirety of our existence is predicated by mediation? What happens when the space of meaning collapses? With time, these new narrative spaces will allow us to breach the limits of physics and explore new terrains within the construct of our consciousness. Perhaps we can soon mediate the narrative, and hence our worldview, to such an extent that a paradigmatic shift may be created in the way we experience our own reality. Our next foray into narrative using these augmented and virtual spaces will in all likelihood introduce us to further discoveries as yet unavailable to our senses. However there is one constant, in the time that it is taken us to reach this point, the Earth has moved along with the Sun in the mechanical dance that is our progress upon this planet. We are poised at the precipice of our future where space and time are no longer the masters of our fate, but soon will be our collaborators. With these magical tools in hand, and spurred by our imagination, ours is a mythic journey to re-envision and remake our world and world-view through narrative and our connection to its shared spacetime. Bahktin, Mikhael (1986). Speech Genres and Other Late Essays (trans. Vern W. McGee). Austin, TX: University of Texas Press. Barsalou, Lawrence (1999). Perceptual symbol systems. Behavioral and Brain Sciences 22, 577–660. Baum, L. Frank (1901). The Master Key: An electrical fairytale founded upon the mysteries of electricity and the optimism of its devotees. Indianapolis, IN: The Bowen-Merrill Co., 1901. Blackmore, Susan (2006). Natural selection applies to everything. New Humanist, May/June 2006, 23-24. http://www.susanblackmore.co.uk/Articles/NH%20memes%202006r.htm [Accessed 24 June, 2015]. Boyd, Brian (2009). On the Origin of Stories: Evolution, cognition, and fiction. Cambridge, MA: Harvard University Press. Caracciolo, Marco (2011). Narrative, Embodiment, and Cognitive Science: Why Should We Care? A lecture at Ohio State University, Nov. 2011. https://projectnarrative.osu.edu/files/projectnarrative/Caracciolo-PN-Presentation.pdf [Accessed 20 June, 2015]. Damasio, Antonio (1994). Descartes’ Error: Emotions, reason and the human brain. New York, NY: Avons Books. Dawkins, Richard (2006). The Selfish Gene, London: Oxford University Press. Glenberg, Arthur (1997). What memory is for. Behavioral and Brain Sciences 20, 1–55. Herman, David (2014). Cognitive Narratology. The living handbook of narratology, revised Dec 2013. http://www.lhn.uni-hamburg.de/article/cognitive-narratology- revised-version-uploaded-22-september-2013. [Accessed 01 October 2014]. Lakoff, George, & Johnson, Mark (1999). Philosophy in the Flesh: The embodied mind and its challenge to western thought. New York, NY: Basic Books. McLuhan, Marshall, & Fiore, Quentin, with Jerome Agel. (2003). The Medium is the Massage: An inventory of effects. Toronto, CA: Penguin Books. Peirce, C. S. (1866/1935). Collected Papers—Scientific Metaphysics, vol. 6 (eds. C. Hartshorne & P. Weiss). Cambridge, MA: Harvard University Press. Shapiro, Lawrence (2011). Embodied Cognition. Oxford, UK: Routledge. Wilson, Margaret (2002). 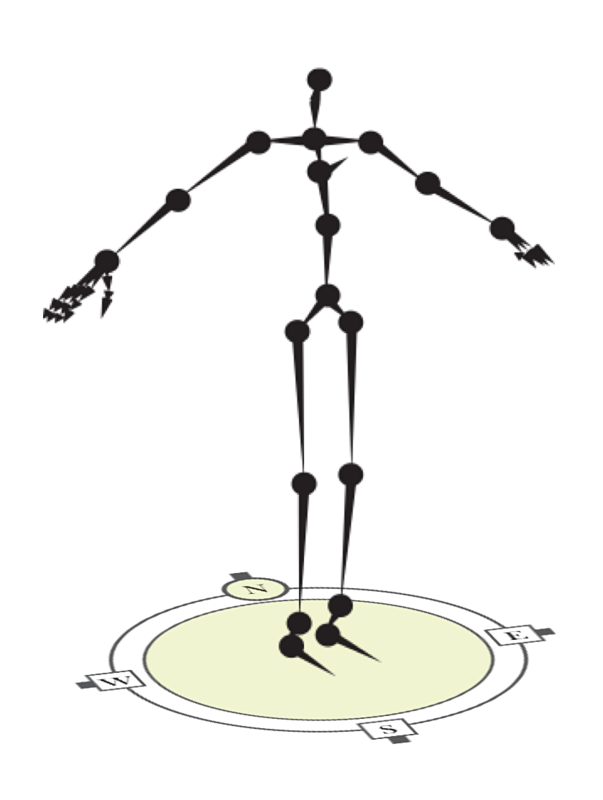 Six views of embodied cognition, Psychonomic Bulletin & Review 2002, 9 (4), 625-636. Law Alsobrook is a poet, graphic designer and educator at Virginia Commonwealth University in Qatar where he teaches design courses at both undergraduate and graduate level. He has an ardent and active interest in narrative studies and their production, design semiotics and visual communication and their conjuncture with regard to media and consciousness. He is Co-Editor and Art Director for Diode Editions. At present, he is currently pursuing his Ph.D. at Plymouth University’s Planetary Collegium in the Centre for Advanced Inquiry in the Interactive Arts where his research focuses on the role of narrative and language as intermediate agents of consciousness.